AFRICANGLOBE – South Africa’s apartheid regime is remembered as one of the worst crimes against humanity of the 20th century. The White monopoly capitalist system that underpinned apartheid remains alive and well today. White monopoly capitalism is the post-apartheid economic system, whereby whites continue to exert disproportional and undemocratic control over the nation’s economy, land, media and judicial system. The American investment bank, Citigroup, recently ranked South Africa as the world’s richest country in terms of its mineral reserves, worth an estimated $2.5 trillion. South African whites and Western foreigners own a staggering 80 percent of this wealth. South Africa is unquestionably the world’s most racially unequal society. Whites comprise only 12 percent of the population. Thanks to the past 350 years of racist exploitation, whites owned 87 percent of agricultural land by Independence Day, 1994. During these 21 post-colonial years, precious little has changed. One exception is that Black people in rural areas have lost 600,000 jobs since independence. This has created a great wave of migration into urban townships. 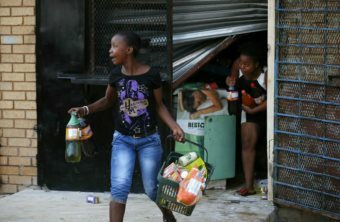 South African townships have served as both the location of recent xenophobic violence, as well as the catalytic cause of the violence. During the apartheid era, white monopoly capitalists created the township. The process included evicting Black people from properties that were in areas designated as “white only”, and relocating them into urban townships. Blacks were forced to move into squalid, overcrowded and segregated townships, designed to mould the Black labour force into an orderly, submissive underclass. Streets of grim “matchbox houses” were arranged in strict grids and surrounded by a fence with only one or two points of entry, allowing the white regime’s police to seal off entire neighbourhoods with minimal effort. In such a setting, violence was both naturalised and easily instigated for political purposes. To this day, Blacks in townships still have to contend with non-existent sanitation and electricity services, as well as rampant crime. When Nelson Mandela was released from 27 years in prison in 1990, the Black townships exploded in endless celebration. Today, after 21 years of the ANC government, which has been more concerned with appeasing white monopoly capital than redistributing land and resources to poor Blacks, townships have exploded into violence. Franz Fanon, who was an expert on the psychology of colonial violence, noted that the historical and current system of white-on-Black violence sends messages of Black inferiority that are so powerful that many Black people succumb to them, ultimately becoming defined by them. Internalised racism, a term first used by Bblack scholar W.E.B. DuBois in 1903, involves accepting a white supremacist social order that places Black people at the bottom, and adopting society’s negative stereotypes about Blacks concerning their lack of abilities, inherent violence and low intrinsic worth. Internalised racism is a major legacy of apartheid. South African society historically judges violence inflicted on Blacks less harshly than violence against whites; consequently, Black people begin to believe that their own life and the lives of other Black African people are worth very little. This creates the preconditions for the ongoing Afrophobic violence. Xenophobia can be defined as a “hatred, dislike or fear of foreigners”; combining the Greek xenos (“foreign”) with phobos (“fear”). Internalised racism demonstrates itself as the absence of attacks against white immigrants because African immigrants are pejoratively portrayed by the media as “foreigners”; whereas, whites are considered “tourists” or “expats”. The nation’s largest labour union, Cosatu, has just said that “white monopoly capital in the hospitality and retail industry” has deliberately chosen to employ foreigners over their South African counterparts in order to exploit foreigners. 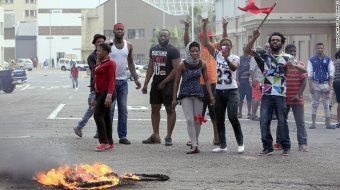 The United Nations’ Office for Refugees confirmed that the recent wave of xenophobic “attacks began in late March following an apparent labour dispute involving South African and foreign workers”. The tragic irony of ongoing xenophobic attacks is that at least six Africans have lost their lives, and yet those Africans all came from nations that harboured South African freedom fighters during the war of liberation against the white apartheid regime. Apartheid, literally meaning “apartness”, transformed Africans into foreigners on their own land. For as long as Black South Africans continue to be foreigners to their own economy, living outside the borders of affluent neighbourhoods, violence will continue to tear at the very fabric of the so-called “Rainbow Nation”.